I just completed a MOOC from Duke on the possible biological underpinnings of why human beings make music and why we prefer certain scales/modes in the music we enjoy. And while the conclusions seem somewhat obvious, I think that Dr. Dale Purves, who taught the class, is excited to have some empirical data to give credence to his theory. Empirical data brought to you by computers and their algorithms. So here is what I understand from taking this class – sound is a disturbance of air molecules that are gathered by the outside of the ear (the pinna) and guided into the ear canal. Depending on age and health, humans have the ability to hear frequencies from 20 hz to 20 Khz. But the ear canal itself is shaped in a way that amplifies frequencies between 100 hz and 1000 hz – the very frequency range of the human voice. So the ear canal actually prioritizes these frequencies over all the other frequencies that we can hear. 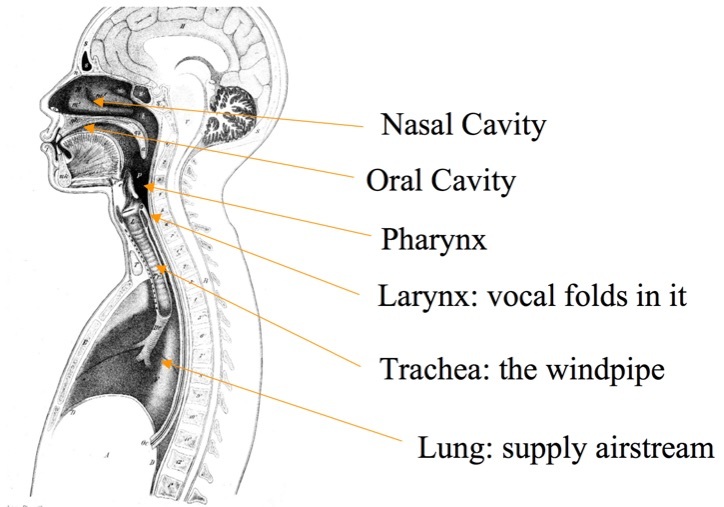 In addition, Dr. Purves made the point that the physical components of the vocal tract, to which our ears are so attuned, have all of the characteristics of a musical instrument. Vocal cords, bowed by a stream of air, change pitch through tension that changes the length of the cord. The tongue, mouth and lips are the envelope shaping the attack, sustain, release and decay of the pitches. The torso, throat, and sinus cavities are the resonators projecting tones out into the environment. So far, all of this is common knowledge from the physics of biology. Purves’ point here is that these are important evolutionary characteristics of both the ear canal and the vocal tract – enabling us to discriminate humans from other beings and to assess another human’s size, mood and reproductive potential. Our ancient ancestors relied on these specialized capacities to survive and thrive on the planet. Music has already been introduced into the equation with the recognition that our vocal tract has the characteristics of a musical instrument. As such, it seems likely that the human voice was the “first” musical instrument. While this is not a new idea, the proofs for the idea are based in a phenomonological sensibility. This is where the amazing ability of computers to crunch data and illustrate our theories comes into play. Dr. Purves accessed the Texas Instrument MIT speech corpus data base to demonstrate empirically that human speech actually contains harmonic overtones and the tonal ratios we associate with music. This was achieved by taking a small snippet of spoken English from the database, 100 milliseconds in length, thousands of examples of this snippet from different voices, normalizing it to an octave range and examining the sonic spectra. This examination revealed that human vocalization does indeed contain frequency relationships that are associated with music. Dr. Purves emphasized that this is not prosody or speech inflection. This is a deeper layer of analysis where we can see amplitude bumps at frequencies aligning with the harmonic overtone series. The conclusion being that when we listen to each other speak we are exposed to ratios of musical intervals. The “musicality” of the human voice coupled with an ear attuned to the particular frequencies of that voice suggests that pre-linguistic human vocalizations were very likely our primary source of tonal sounds in the evironment in which we evolved. Thus, human vocalizations were likely the precursors of what we call music. So far, we have some interesting evidence for a biological explanation of not only why we enjoy music but how we came to create music in the first place. Many of the beings we share the planet with can make sounds, but the making of music is a distinctly human activity. Taking sounds and organizing them into particular harmonic relationships, into predictable forms and catagorical genres is the purveyance of human beings. The various genres of music from folk to opera, make it pretty clear that music helps us feel, understand and express emotions as well. So it is from this place that Dr. Purves moved into why we prefer certain musical scales/modes. Things got a bit more complex here as we explored definitions and explanations of music, consonance, dissonance, cadences, intervals and scales. I did not follow Dr. Purves down these paths quite as easily. Most of what followed had to do with comparing the speech spectra to designations by musicologists as to perceptions of consonance/dissonance, intervals and scales. The conclusion being that we prefer scales and intervals that have the greatest harmonic overlap with the harmonics found in the human voice. Given the evidence above, human beings may have been predisposed to make music based on our biological apparatuses for sending and receiving sound. The ear prioritizes the frequencies of the human voice. The harmonic overtones and ratios of musical intervals that we associate with music are embedded in human vocalization as was demonstrated by the spectrum analysis of vocalized speech. Dr. Purves argues that the biological evolutionary imperative that attunes us to human voice has shaped our preference for the tones and harmonics that we take pleasure in hearing, and, by extension, constrained our choices in the scales we use to create music. As I listened to Dr. Purves’ premise and the various methods and proofs he used to assert this idea, my thought was, “Wow, this is an amazing explanation of what may have been in the past, but what about now, in the present.” Biological imperatives were important as humans were getting a foothold on the planet, but it feels like evolutionary imperatives really must take a different turn at this time. Human beings have a stranglehold on the planet, so we need to evolve beyond the ideological assumptions we hold so dear about our biology. Perhaps one of the ways to shift this is to use our brains and conciousness to focus on a wider variety of tones, intervals and scales. I think some of the music of the 20th Century, including the emergence of electronic music, started moving us in this direction, and it continues into the 21st Century. After all, we do have free will choice. We do not have to be victims of our biology.